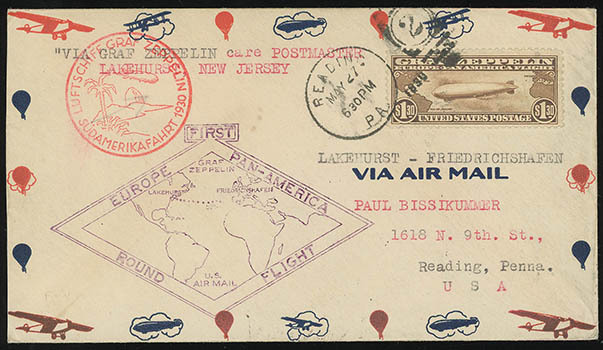 Airmail, 1930, 65¢ Graf Zeppelin, choice centering, tied by "Lakehurst, N.J., Jun 1, 1930" flag machine cancel on Zeppelin picture post card, purple U.S. Lakehurst - Sevilla flight cachet, Extremely Fine, an exceptional usage. Scott No. C13 Estimate $150 - 200. 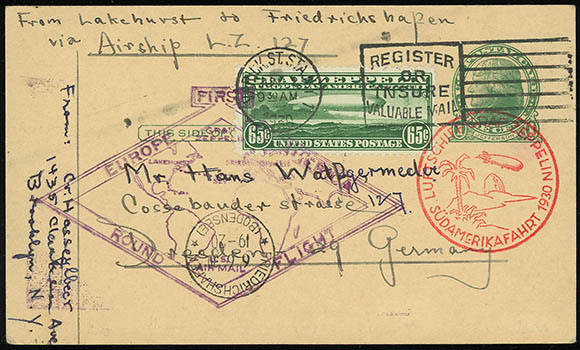 Airmail, 1930, 65¢ Graf Zeppelin, vertical pair, tied by "Lakehurst, N.J., May 31, 1930" flag machine cancel with bottom stamp additionally canceled by straight line Lakehurst N.J. handstamp, on airmail cover, red German and purple U.S. flight cachets, green Zeppelin receiving backstamp, Very Fine. 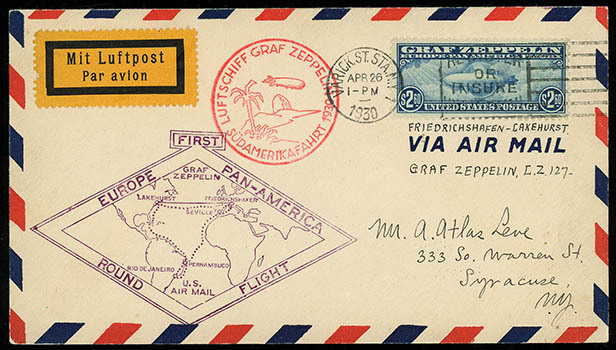 Airmail, 1930, 65¢ Graf Zeppelin, well centered, tied by "Varick St. Sta., N.Y., May 20, 1930" slogan machine cancels on post card, Friedrichshafen transit and red German and purple U.S. flight cachets, Very Fine. Scott No. C13 Estimate $100 - 150. Airmail, 1930, 65¢ Graf Zeppelin, rich color, tied by "Varick St. Sta., N.Y., Jun 2, 1930" slogan machine cancel on 1¢ postal card, Friedrichshafen transit and red German and purple U.S. flight cachets, Very Fine. 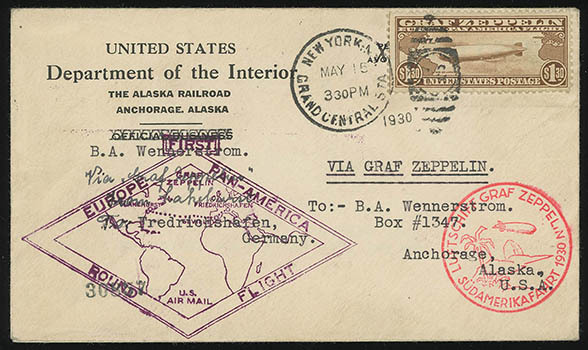 Airmail, 1930, $1.30 Graf Zeppelin, tied by "New York, N.Y., Grand Central Sta., May 15, 1930" duplex cancel on flight cover with "Department of Interior, The Alaska Railroad, Anchorage, Alaska" corner card, red German and purple U.S, flight cachets, green Zeppelin Round Flight receiving backstamp, Very Fine. Scott No. 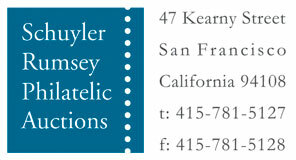 C14 Estimate $200 - 300. 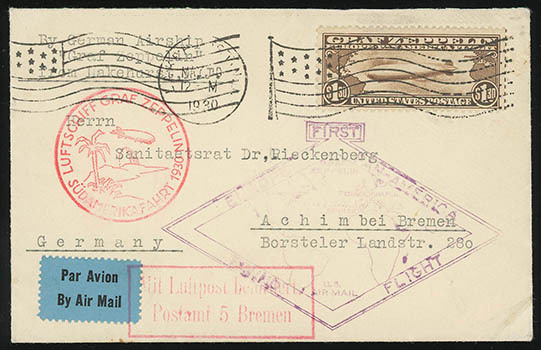 Airmail, 1930, $1.30 Graf Zeppelin, tied by "Lakehurst, N.J., May 30, 1930" flag machine cancel on flight cover, red German and purple U.S. flight cachets and airmail label tied by German directive handstamp, Very Fine; with 1989 P.F. certificate. 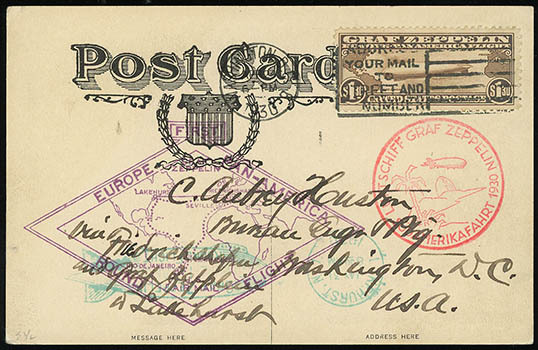 Airmail, 1930, $1.30 Graf Zeppelin, deep color, tied by "Washington D.C., Apr 24, 1930" slogan machine postmark on Zeppelin "Greeting from Washington" post card, red German and purple U.S. flight cachets and Lakehurst Zepp receiver, Very Fine. 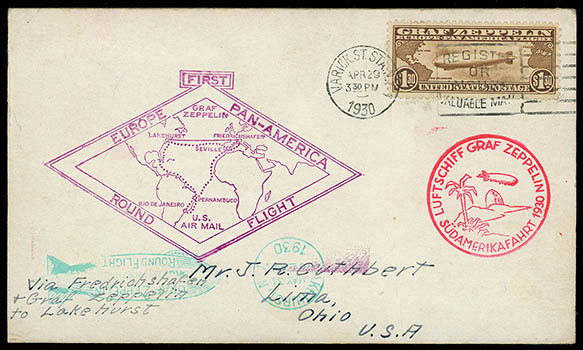 Airmail, 1930, $1.30 Graf Zeppelin, tied by "Reading, Pa., May 27, 1930" duplex postmark on illustrated border airmail cover, red German and purple U.S. flight cachets, Freidrichshafen transit and receiving backstamps, Very Fine. 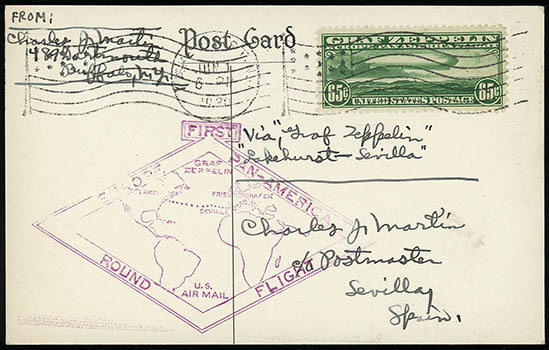 Airmail, 1930, $1.30 Graf Zeppelin, tied by "Varick St. Sta., N.Y., Apr 29, 1930" slogan machine cancel on heavy card, red German and purple U.S. flight cachets, Lakehurst Zepp receiving postmark, Very Fine. 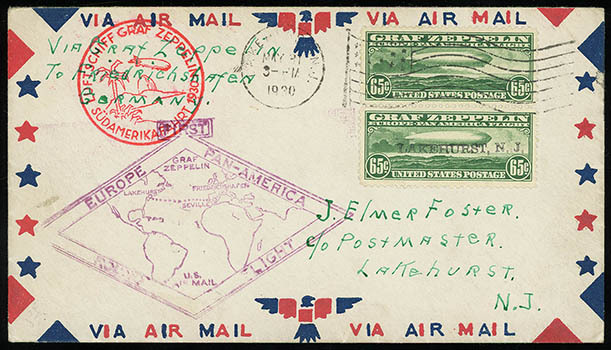 Airmail, 1930, $2.60 Graf Zeppelin, tied by "Varick St. 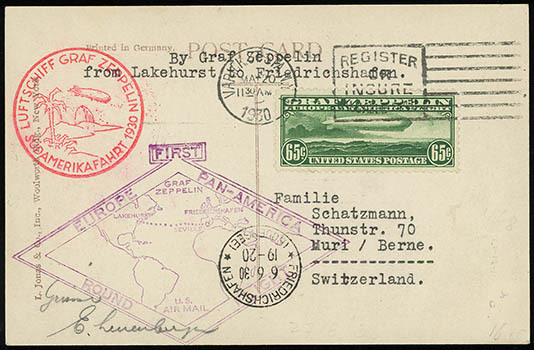 Sta., N.Y., Apr 26, 1930" slogan machine cancel on airmail flight cover, red German and purple U.S. flight cachets, Lakehurst Zepp receiving backstamp, Extremely Fine, a gem flight cover. Scott No. C15 Estimate $400 - 600.